Whenever you create the instance of subclass, an instance of parent class is created implicitly which is referred by super reference variable. super can be used to refer immediate parent class instance variable. super can be used to invoke immediate parent class method. super() can be used to invoke immediate parent class constructor. We can use super keyword to access the data member or field of parent class. It is used if parent class and child class have same fields. In the above example, Animal and Dog both classes have a common property color. If we print color property, it will print the color of current class by default. To access the parent property, we need to use super keyword. 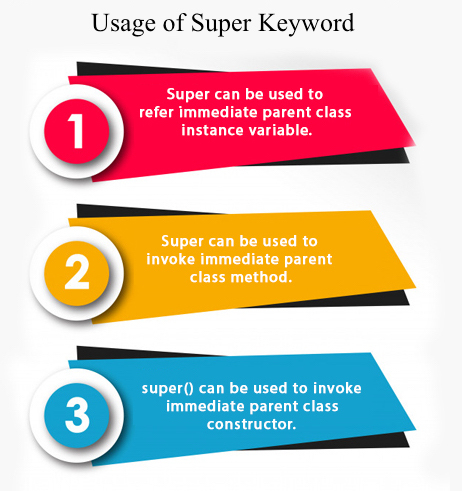 The super keyword can also be used to invoke parent class method. It should be used if subclass contains the same method as parent class. In other words, it is used if method is overridden. In the above example Animal and Dog both classes have eat() method if we call eat() method from Dog class, it will call the eat() method of Dog class by default because priority is given to local. To call the parent class method, we need to use super keyword. 3) super is used to invoke parent class constructor. Note: super() is added in each class constructor automatically by compiler if there is no super() or this(). As we know well that default constructor is provided by compiler automatically if there is no constructor. But, it also adds super() as the first statement. Let's see the real use of super keyword. Here, Emp class inherits Person class so all the properties of Person will be inherited to Emp by default. To initialize all the property, we are using parent class constructor from child class. In such way, we are reusing the parent class constructor.